Part of the first Twilight Struggle test map, circa 2002. The game ends in nuclear war only about 5 percent of the time. That’s a good thing. It gives Ananda Gupta faith in humanity. 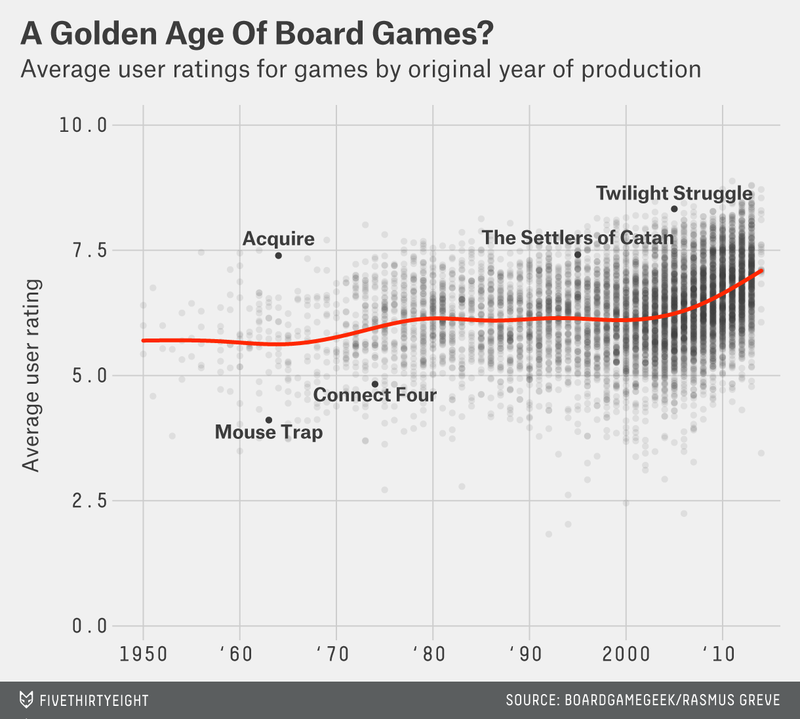 The game is called Twilight Struggle, and it’s the top-ranked board game in the world. It occupies the No. 1 spot on the authoritative gaming-world website BoardGameGeek. Gupta, 38, of Columbia, Maryland, is the game’s co-designer. A video-game designer at Firaxis Games by day, he recreated a post-World War II universe out of cardboard. In Twilight Struggle, players peddle influence and alter history with playing cards in an effort to win the Cold War. And, ideally, avoid nuclear apocalypse. I spoke with Gupta, and turned to a vast board game database, to uncover what makes a board game great. Serious games — whether they be hobby games, boutique games or Euro games — are having a moment. Over the past five years, their market has grown an average of 15 percent a year, to $700 million in 2013. The Settlers of Catan and Ticket to Ride — popular gateway drugs of the genre — are the third- and fourth-best selling board games on Amazon.1 There’s more to these games than “roll the dice, move your mice.” Games in this broad category are typically characterized by deep strategy, an emphasis on skill and the lack of player elimination. In other words, they’re not Monopoly. These are the BoardGameGeek ratings of all such games, by the date of their original publication. So, how do you design the world’s best board game? The first lesson is persistence. Twilight Struggle traces its roots to the early 2000s and a board gaming club at George Washington University. That’s where Gupta and co-designer Jason Matthews met. Not GW students themselves, they were friends with some, and would go to the school to play and also to bemoan the increasing complexity of historical games — a genre especially dear to them. The rulebooks were overlong, the game mechanics baroque. They originally intended to do a game about the Spanish Civil War but realized they’d been scooped by a guy in Spain. “We’re probably not going to do a better job than he is,” Gupta joked. They eventually settled on the Cold War. Most games on the topic had focused on when the Cold War got hot. But thermonuclear war is depressing. Gupta and Matthews instead designed a game about the geopolitics, rather than a hypothetical military conflict. Matthews, of Alexandria, Virginia, is an American history expert and was the legislative director for Sen. Mary Landrieu of Louisiana. Gupta, a history buff, was doing policy work at a think tank, then was in school for computer science, before dropping out after he landed his first job in the video-game industry. The two would discuss key aspects of the Cold War — the domino theory, the arms race, the space race — and these would make their way into the game. The first Twilight Struggle test map, circa 2002. Courtesy of Ananda Gupta. But publishers balked. “The Cold War? Why would anyone want to play a game about the Cold War?” Gupta recalled being asked. Salvation came in the form of the company GMT Games, and its Project 500 — a kind of Kickstarter before Kickstarter was cool. Interested gamers would pledge money, and GMT would print the game if enough capital was raised. Even then, it took a grinding 18 months for Twilight Struggle to generate enough pledges to warrant a printing. That first printing sold out in 20 minutes. It has gone on to amass 17,781 ratings on BoardGameGeek, as I write, with an average rating of 8.33. Gupta has a few theories about why his game has done so well. For one, it’s a two-player game — the Americans vs. the Soviets. Two-player games are attractive for a couple of reasons. First, by definition, half the players win. People like winning, and are likely to replay and rate highly a game they think they have a chance to win. Also, with just one opponent, there is little downtime. You don’t have to wait while the turn gets passed around the table to three, four or five other players. That’s boring. 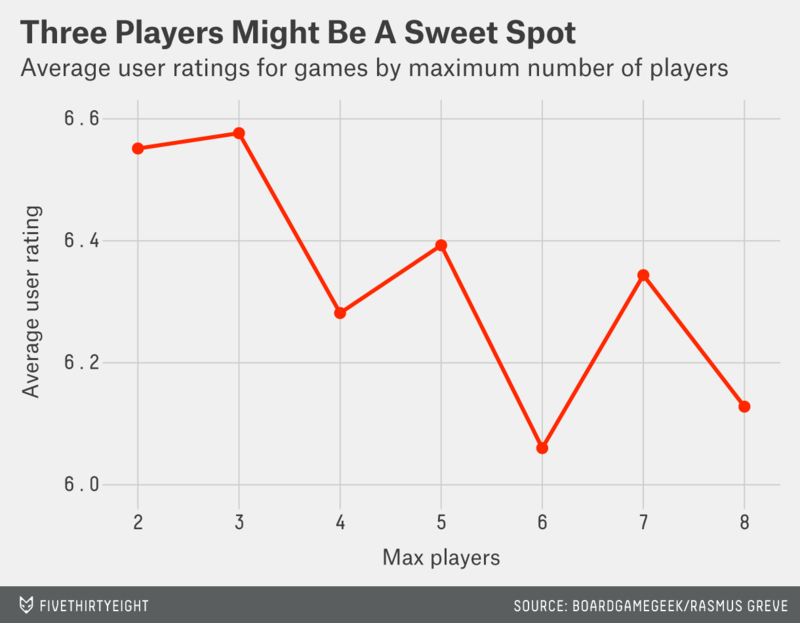 Here are games’ average ratings by the number of players a game supports. The data offers some evidence for Gupta’s hypothesis. Games that support three players rate highest, with an average of 6.58. But two-player games are a close second, with an average rating of 6.55. Next closest are five-player games, which average 6.39. Another element working in Twilight Struggle’s favor is its length. BoardGameGeek lists its playing time at three hours, but Gupta said it’s more like two and a half. (When designing, he was aiming for two.) Games’ lengths need to strike a balance. Again, Gupta’s suspicion seems borne out, empirically. The shortest games are the lowest rated, on average. But players don’t favor length without bounds. Three hours seems to be right around the point of diminishing marginal returns. There’s even a website — Twilight Strategy — devoted to the strategic intricacies of the game. “They are doing a great public service,” Gupta said. But there’s also a healthy dollop of luck. Players draw cards randomly and, by the laws of probability, are not likely to have had any specific hand before. Remarkably, the empirical success of the game came mainly not from the fine calibration of some statistical model, but rather from game designers’ intuition. 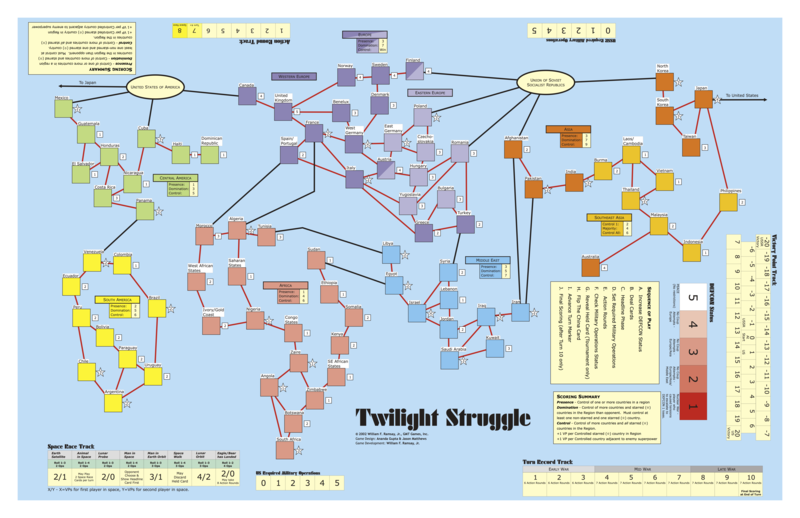 Twilight Struggle is emblematic of a sea change from older, magisterial games with titles like Rise and Decline of the Third Reich, War in Europe and The Civil War. (The Civil War’s listed playing time is 1,200 minutes.) The redistribution of game information from massive rulebooks onto game cards was a revolution that can be traced to Mark Herman’s We the People, a game about the American Revolution, and Paths of Glory, a World War I game by Ted Raicer. Twilight Struggle, in turn, has its descendents. Its most direct is 1989 — no, not that “1989” — another Cold War game. Other offspring include 1960, a game about the Kennedy-Nixon presidential election, and Labyrinth, about the war on terror after 9/11. But these games aren’t the end of history. The next innovation, predicts Gupta, is topic — what the games are about. Historical game designers are beginning to move beyond Gettysburg, the Bulge and Waterloo. In addition to spawning the next generation of games, Gupta is busy spawning the next generation of gamers. Much of his gaming is now done with his 10-year-old son. He recommended the games King of Tokyo and Sushi Go! for the budding gamer. 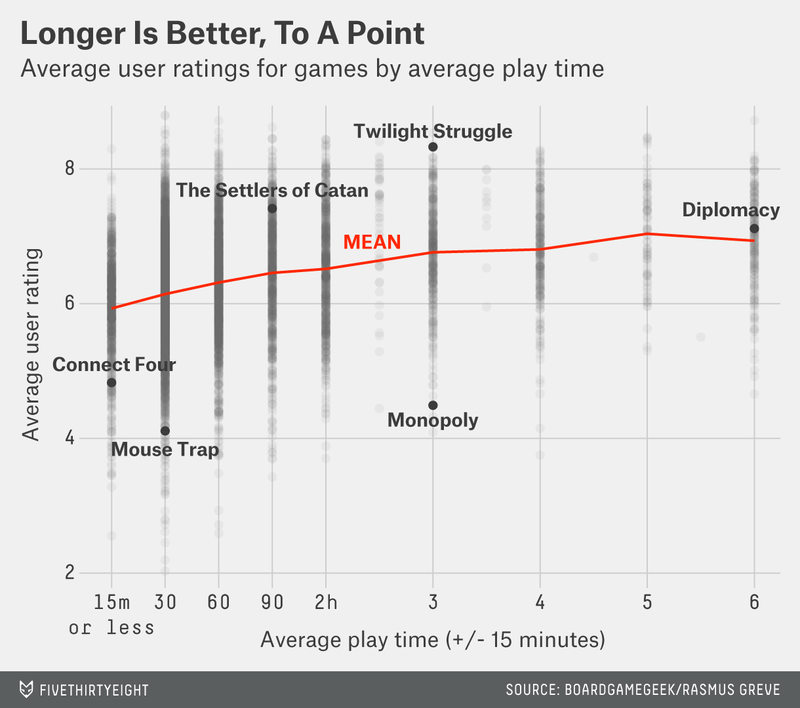 But Twilight Struggle has topped the leaderboard for a long time. Uneasy lies the head that wears the crown? Not necessarily. Gupta thinks there’s a chance for a successor. Connect Four and Hedbanz are Nos. 1 and 2. For more information on the data-mining project, and this data in general, see Greve’s and his co-authors’ paper. Note that Twilight Struggle’s No. 1 rank doesn’t mean it simply has the highest average rating. BoardGameGeek’s algorithm does a number of things to assure that a game with a relatively small number of ratings can’t climb the leaderboard too quickly. It’s important to note that some argue that ratings may be inflating — a symptom of a cult-of-the-new effect: Players tend to have a bias toward new games and to rate them more highly, at least for a time.